There is a handful of clockmakers whose work is known through only one single surviving example, and that is the case with the clockmaker under discussion here, Solomon Wasson of Bristol. It is a strange surname. At first I thought it might just be a quirky rendering of Watson, but not so. It is in fact a real name, though in what appears to be its area of origin in the West Country it was occasionally written as Wason, or Wazen or Wazzen - perhaps an attempt to write it in a local accent. The name is uncommon even in this area. I think it was the late J. K. (Jack) Bellchambers in 1968 who first noted Solomon Wasson's freedom at Bristol in January 1642 (along with that of his son, David, in 1670), when he listed the clockmakers made free there in his book 'Somerset Clockmakers', though I think some of these extracts were published previously by the local antiquarian society. Wasson was in fact the first clockmaker to be given the freedom to trade at Bristol. In those days the calendar year ran from March to March, so January 1642 is what we would today call January 1643. At this point Solomon Wasson was no more than a name in old records, as no example of his work had then been documented. It was not until 1981, when my book 'The Early Clockmakers of Great Britain' was published, that an example of his work was illustrated, which was the clock pictured here, the only clock so far known by him. George White published the same photograph of this clock in his book 'English Lantern Clocks' in 1989, and undertook research into his background, deducing from the wording of his freedom entry that he was not a native of Bristol. At that time (1981) the clock was owned by a collector with a good eye for lantern clocks, and but for his discerning taste, we might today be totally unaware of the nature of Solomon Wasson's work. This clock is 'important', not just because it is a very early clock dating from the time of the Civil War, not just because its maker was the first clockmaker to work in a city which became the principal clockmaking centre outside London, not just because this is probably the oldest surviving Bristol clock, but because his clock was made in the London manner, a style very different from that which soon became the Bristol norm. The style of his clock suggests he was trained in London, as George White observed. But this training was not through the most likely source, the Clockmakers' Company. In fact he was ultimately mentioned in the records of that company, as we will see later, but he was himself not a member. In searching for a possible apprenticeship in London I tried the records of several City Companies including the Blacksmiths Company, which was the next most likely one. In those records appeared an entry of an apprenticeship in February 1639/40 of Simon Wason, son of Stephen Wason of Chewton, Somerset, husbandman deceased, to Alexander Watts. Simon Wasson (I'll keep to one form of spelling) also took an apprentice of his own in the Blacksmiths' Company in November 1650, being one Henry Collett from High Wycombe. At first I thought this might be a misrendering of Solomon Wasson - easily done in those old records when some clerk was writing up the neat books perhaps once a week from jotted abbreviations on scraps of paper. But in fact it was clearly written as Simon, and more than once! Alexander Watts may have been the son of a namesake who married at Shepton Mallet (next door to Chewton) in 1614, and who was working in St. Ann's parish Blackfriars, London 1637-42 and who took other Blacksmith Company apprentices from Bristol and nearby. It was not unusual for country boy who went to work in London to later take as apprentices more youngsters from his home locality, where he would obviously have kept up his contacts. 1. The only known clock by this maker, signed 'Solomon Wasson of Bristoll', made after 1643 and probably before 1650. Re-instated balance wheel escapement and alarm. Iron hand probably original. So Chewton Mendip was a very strong clue, if nothing else, for the origins of a similarly-aged namesake employed in the metal trade. I noticed in Jim Moore's book 'The Clockmakers of Bristol' that he quoted an inscription on a church bell from Chewton Mendip 'T. Pengard Churchwarden, Wil. Coventry Carpenter, Thomas Star ye Plumer, S. Wason Ye Master 1627'. That had to be the same Stephen, father of Simon, and implied that he was a bellfounder in 1627. A search of the parish registers was inconclusive, but then there are considerable gaps at this period. We did find the baptism of Simon, son of Stephen and his wife, Martha, in 1619, along with several other children baptised between 1603 and 1626, but not a baptism for Solomon. So the theory that he came from Chewton remains unproved. Neither could a burial be traced for Stephen, though we know he died between 1627 and 1640, and it seems as if the family moved away from Chewton soon after 1627. My feeling is that one day we will trace Solomon Wasson's parentage at Chewton. Whether or not Solomon was born in Chewton is not important. What is important is that the style of his clock shows that he was trained in London methods and that he used London castings. His pillars are separate pillars with screw-on finials and feet, unlike the integral castings with feet and finials all in the one piece, which already were known in the West Country and soon became the general trend there, especially around Bristol. The engraving of this dial centre is typical of London styling just before and during the Civil War. This is a style I call a 'ring-of-roses', whereby a circle of several separate objects such as flower-heads (usually six, as here, but not always) are spread evenly around the alarm disc, loosely linked together by a thin tracery of foliage. These things alone tell us that this clock (and this is the only one we have to judge his work by) was made in the London manner. But recently I was able to examine the clock and was delighted to find more direct evidence of this. Inside the clock are three separate casting marks which are those of an unidentified London brassfounder, usually referred to as the 'matchstick man'. I believe the term may have been first coined by George White, but it has caught on and is now in common usage, even though we don't know who the matchstick man was. This casting mark is found on the clocks of several London makers over an ill-defined though broad period but at least between the 1630s and 1660s (or a bit later), which will do for our purpose here. The period is so long that this was probably a company mark rather than that of one individual. Many makers used castings bearing this mark, including several who worked in Lothbury (William Selwood, John Selwood, Thomas Loomes, Thomas Knifton) but also others elsewhere in London. I have sometimes wondered whether this might be a casting sign from the Mermaid workshop (run initially by the Sellwoods then by Thomas Loomes), as early mermaids were pictured with a forked 'tail', which might resemble the two forked legs of a matchstick man. The mark is often found on clocks made at the Mermaid as well as on the work of others supplied by this unidentified brassfounder. Lothbury was destroyed in the Great Fire in 1666 of course, though the brassfounder could have moved premises and kept the same mark. This is only really speculation, arising because we cannot understand what its originator intended to signify by this figure of a man. 2. 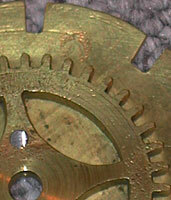 The clock with its alarm disc removed to show the appearance it would have had during its time with an anchor escapement. The multi-leaved flower (Tudor Rose?) was often a convenient centre piece. This proof that Solomon Wasson was using London castings, and probably a London engraver too, is interesting and indicates that he was familiar with the trade suppliers there. We know his former apprentice, Bernard Gernons, had links with London. I can't help but think that Wasson was trained there, and one day his apprenticeship may come to light in the records of some other City Company. But regardless of where he was born and trained, it may be that he had no choice but to use London castings in the later 1640s, when the Civil War was raging and all possible supplies of brass were looted and plundered by the armies of both the King and Parliament, including church brasses and household goods. If for no other reason than shortage of brass supplies it is surprising that any clocks at all were made during the Civil War, and in fact there seem not to be very many that we can positively pin down to that period. It is also amazing that not all those made before the war were entirely destroyed and melted down for cannon, for, though they are scarce, some pre-Civil War clocks do exist. This clock was at one time converted to anchor escapement, which would necessitate removing the alarmwork on the backplate, as it was in the way of the pendulum. When this was done sometimes the alarm disc was also removed (being then superfluous) and sometimes it was left in place to avoid a blank centre. In this instance the disc was removed, presumably by whoever converted the clock to anchor escapement, and who then engraved (or caused to be engraved) in the dial centre a beautiful Tudor Rose surrounded by a rope-like circular band. I think it was George White who first pointed out that this decorative rope band tends to be a feature which was favoured by certain clockmakers in the Chew Valley near Bristol. The replaced alarm disc is slightly smaller than the original and allows the ropetwist band to show, which now surrounds the engraved centre space, which would have been originally left blank. Several variations of this rope band occur, as used by about half a dozen different clockmakers, but the clockmaker whose work most resembles this particular version is Edward Webb of Chew Stoke, and his son, Edward junior of Flax Bourton. This distinctive later centre engraving may well mean that the clock was converted from balance wheel to anchor escapement by one of the Edward Webbs, senior or junior, both of whom worked only a few miles from Bristol. Edward senior worked from the 1660s to 1694, when he died. Edward junior, who may have moved to Bourton after his father's death, worked from about 1690 to about 1710, perhaps longer. The anchor escapement was first known in the area in 1675 (on a dated clock by James Delaunce of Frome), but was probably not widely known till some years later. So if I had to guess I would say the conversion was done by one of the Edward Webbs, father or son, between the 1680s and about 1700, by which time the ropetwist circle seems to have passed from fashion. With a balance wheel escapement a lantern clock generally runs for eight hours, perhaps a little more if hung so artificially high on the wall that you can barely see the time on its dial. When converted to anchor these clocks were often modified to run for thirty hours on a single weight. Sometimes however the two separate weights for going and strike were left in operation and a pulley system was fitted by tying off each end of each rope under (or through) the baseplate. That is just what has happened in this case, the result being the clock runs for about sixteen hours at a sensible height (head height). The weights then need to be about twice as heavy as normal, that is around ten pounds. 3. The inside of the countwheel also has a clear matchstick man casting mark. In January 1643 we know Solomon Wasson was in Bristol, as he was still in April 1643 when he took John Clarke as an apprentice there (freed February 1650). In April 1649 Solomon Wason took an apprentice in Bristol, variously written as Bernard or Barnett Garnon or Gernon(s), who came from Charleton in Wiltshire. By 1656 Garnon was probably due to be free from his apprenticeship, but we have no record of his taking up that freedom anywhere. In December 1658 Garnon was fined by the Clockmakers' Company for trading in London as a non member and his work was ordered to be defaced as inadequate. He was also ordered to bring proof of his training, which he did six months later in July 1659, at which time he was admitted as a Free Brother, being described as a former apprentice of Solomon Wasson of Bristol. The fact that Wasson is mentioned by name gives me the impression that he was known to the Company, as the master's name was not always mentioned when proof was brought in of an apprentice's training in the provinces. It is possible that Wasson, though from Bristol, was himself working in London at the time of Garnon's entry into the Clockmakers' Company. Garnon continued working in London till August 1663, after which he is not heard of again. What we don't know is whether Solomon Wasson remained in Bristol after 1643, or returned to work in London for some of the period when he is not documented at Bristol (i.e. between 1650 and 1661). Did Garnon go off alone to work in London or was Wasson with him at that time as his master? If Wasson was a freeman of some other City Company, he could have worked there, either for himself or some other master, without being made to join the Clockmakers Company - for a while anyway. Whether he did work continuously in Bristol for over thirty years, or part of that period in London, it is still surprising that he is known through only this one clock, signed at Bristol. In fact no other clock is known by him signed at London either. Where is all the other work this man must have produced during his long working life? However much we attempt to study clocks of this age and their makers, there always remain more questions than answers. With a solitary example of his work as all we have to go on, it is difficult to draw any conclusions. By contrast we do know several lantern clocks by Thomas Browne, who began his career in Bristol the same year as Wasson, and worked for only a few years longer. His clocks are of a very different character from Wasson's and show very little London influence. Browne was the originator of a more individual and localised 'Bristol' style, but that's another story altogether. Brian Loomes. 'The Early Clockmakers of Great Britain' 1981.